Do your gums bleed when you brush your teeth? Bleeding gums is one sign of gum disease, a very common oral health issue that can have serious effects on a person’s dental and overall health if left untreated. If your gums bleed, you should consult a dental professional as soon as possible. Gum disease is responsible for the majority of tooth loss in adults. At Cardiff Dental, we want to help you save your natural teeth and maintain healthy gums. Gingivitis – this is the first stage of gum disease. Gingivitis is caused by plaque build-up, which infects the gums and causes symptoms of gingivitis. Gingivitis causes your gums to become swollen, tender and bleed every time you brush your teeth. Medications – certain blood thinning medications are considered to be one of the possible causes of bleeding gums. Gums can bleed due to a person’s use of blood thinners. New flossing routine – changing your flossing technique can also cause your gums to bleed. New toothbrush – if you switch from a soft bristled toothbrush to a firm one this can hurt your gums, causing them to bleed. Try to keep using a soft or medium bristled toothbrush. Pregnancy gingivitis – pregnant women are at risk of swollen and bleeding gums. Hormonal changes during pregnancy change the response of the body to the bacteria that cause gum disease. The best treatment for bleeding gums is to remove the plaque bacteria that cause gum disease. Regular dental cleanings can prevent the infection caused by the build-up of plaque and tartar that results in bleeding gums. Should you notice that you have bleeding gums, see us as soon as possible. Seeking treatment for your bleeding gums can help prevent gingivitis and the onset of periodontal disease. Other treatments may involve scaling and root planning procedures or periodontal therapy if you suffer from an advanced form of gum disease. Your doctors at Cardiff Dental can help keep any gum disease under control. We will educate you about oral hygiene and schedule regular dental visits to monitor your condition. 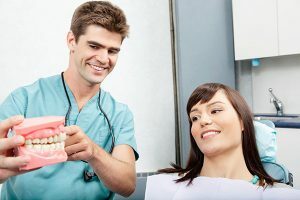 If you have any questions about bleeding gums and periodontal disease, we will be happy to answer them and recommend the best solution to your problem. Contact us on (02) 4954 6888 today!